Harshul Sanghi is the managing partner of American Express Ventures, Enterprise Growth at American Express, with extensive corporate venture and mobile experience and relationships. He’s focused on strengthening American Express' existing online and mobile services through partnerships with the technology and venture community to retain American Express’ strong leadership position. Harshul oversaw the opening of and runs American Express’ first Silicon Valley office. He is also leading American Express’ $100 million Digital Commerce Initiative, working with his team to invest in innovative, digital commerce start-ups. Harshul was previously the managing director of U.S. venture activities for Motorola Mobility. 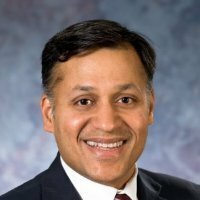 Before Motorola, Harshul was VP, Business Development at Ucentric Systems Inc., and played an instrumental role in the acquisition of Ucentric by Motorola. Harshul also led Philips Electronics’ satellite set top box business in North America where he introduced the concept of DVR to the satellite TV market. Harshul attended the University of Oregon, where he received a degree in Computer Science; and later acquired his M.B.A from the International Institute for Management Development (IMD) in Switzerland. Harshul is also a member of the Steering Committee for the Silicon Valley Project of the Stanford Program on Regions of Innovation and Entrepreneurship (SPRIE). Harshul became a competition judge for the Vator Splash SF (February 2013) competition. Harshul was mentioned in a VatorNews article "What AmEx start-up initiative is seeking to fund"
Harshul was mentioned in a VatorNews article "Behind AmEx's digital commerce start-up initiative"